Ansonia Clock Co. "Crystal Palace No. 1 Extra", ca 1880. 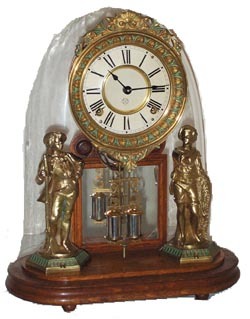 H. J. Daviess advertised his clocks as "Black Walnut Clocks" and "Visible Pendulum, with Glass Shade" (Crystal Palace) clocks. Well this one isnt walnut, but oak. Beautifully restored (or original) condition. I dont think thegreen could have been restored on the dial surround and statue bases. Thewhole clock looks like it has been in a sealed container since 1880. Another of the Millers almost perfect clocks. It is 8 day, bell strike, 17-1/2 incheshigh with the glass dome. I wont bore you with any more sales pitch exceptto say I have never seen or had better. Ly-Ansonia, pages 91-95.